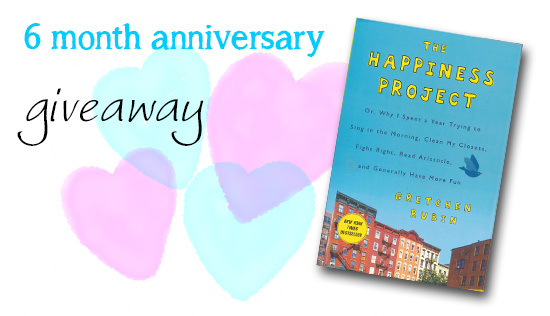 I would like to celebrate with you by offering a giveaway of my copy of Gretchen Rubin's The Happiness Project. I enjoyed reading this book back in January and reviewed it here. If you're looking for simple ideas on how to make your life happier then this book may interest you. I like to think this book could be really helpful to someone out there interested in minimalism and making a more meaningful life not driven by consumerism. Other than looking pretty it's not very useful on my bookshelf right now. I would like to give my copy of this book away to one lucky reader to thank you for your support. This giveaway is open to all followers worldwide who leave a comment below - I'd love to hear from you. I will announce the winner on Thursday 11th April. In the meantime I'm off to the far west of Cornwall for a peaceful week with my family. I will be taking a blogging break for a week to refresh and find new inspiration. Minimalist Monday will be back on Monday 15th April but I'll be back before then. If you're new here please take a look around my archives - there's plenty of varied posts to read. I would love to read that book! Enjoy Cornwall! I spent Easter 2008 there, a wonderful spot! Have a great time! I would love that book!!! O, I can read english! I also would love to read that interesting book! Have a nice Easter weekend! I have been enjoying your blog for months now!!!!! I appreciate how you apply simplicity to the ordinary.....making it so reachable and realistic! Thank you for sharing:) P.S How fun your give away is! I would love to get some inspiration from reading that book. So please let me join your give-away! It's a good book, I got it out of my library . I d like to read it again. Happy Easter and Happy Blogiversary! I hope you have a wonderful holiday with your family. Happy Easter! I'd love to be included in the giveaway. Gretchen's book is quoted all over the web. I've never read it and can't get it from our library so winning it would be awesome! Enjoy your vacation! Enjoy your break. It is a lovely sunny day today....but still with a coldish wind. A book is a wonderful giveaway and I would so much like to win it, I will have a look at the Library and if that fails the mighty Am***n will have to be scanned. Sometimes, time just flys by!! I'm pretty sure I started reading your blog right when you first started 6 months ago! I LOVE IT!! I check everyday for your minimalist inspirations on living and I do love your photos. Here in Oregon of the United States it has been a long cold 6 months and I can always say, Your blog has brightened up my many days this past winter. Thank you for all your precious time you give us all who follow. I do hope you have a WONDERFUL WONDERFUL HOLIDAY!! I'd also love to read the giveaway book. I could sure use some more insight! Happy Easter Clare and enjoy your break and time in Cornwall. An inspirational post, especially as I have just taken the (slightly scary) plunge and started a blog, after a year of thinking about it! Well done on your six months, I really enjoy reading your posts. Hope you have a wonderful break. Happy Easter and thanks for blogging - my house is beginning to look a wee bit empty thanks to you !! Hope you're having a very happy Easter. What a lovely way to mark six months of Just a Little Less. Please include me in the draw. Haven't heard of this book before. We've just come back from Cornwall and we loved it there. Hi, I'm a reader from Brazil and this book seems inspiring! And congratulations! Happy 6 month-iversary Claire. I've enjoyed your blog. I have this book (and really enjoyed it) so I don't need entered in this giveaway. Just wanted to say hello. A late entry for your giveaway Claire - need inspiration Have missed your posts this week. Cornwall looks glorious - we're planning a summer holiday there this year. It's amazing how quickly six months slips by in Blogging World. Somehow I thought you'd been going longer, you have such a nice relaxed style of writing and your photographs are beautiful, you capture colour and mood so well.